Costa Rica sits between the Pacific and the Caribbean. The better diving is on the Pacific coast, particularly in the Northwest: Catalina Islands, Bat Islands and the Gulf of Papagayo. In the Southwest check out Cano Island. The best diving in Costa Rica, though, is arguably at the Cocos Islands, 300 miles off the mainland and a UNESCO World Heritage Site. This world class diving destination is a great place to see pelagic species like marlin, sailfish and sharks when they visit the islands to feed and mate. 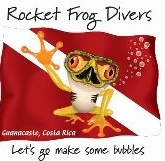 Costa Rican sea temperature ranges from 21 to 29 oC (70 to 85 oF): a 2-3 mm (1/8") wetsuit is may be sufficient for the hardy but at least a 5 mm is needed in the cooler temperatures for thinner divers. The dry season runs from November to May but can be very windy. 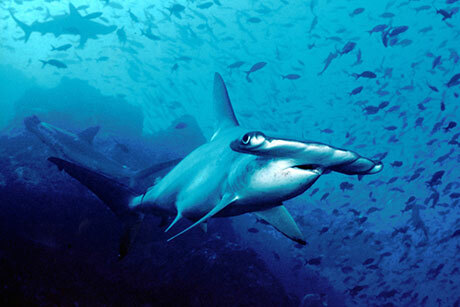 From June to November is the rainy season when hammerhead sharks are more frequent. May is a good time to go as it shouldn't be too windy or wet. Take special care when swimming from all beaches in Costa Rica. Rip tides are very common. Avoid using unofficial taxis - "taxi piratas". Violent incidents involving tourists have been reported. Official taxis are red with a triangular sticker and plastic box on the roof with the name and number of the taxi company. Medical care in Costa Rica is of a high standard, but only emergency medical treatment is available free for visitors. Make sure you have adequate travel health insurance and accessible funds to cover the cost of any medical treatment abroad. The Cocos Islands are reached by a 10 day liveaboard trip. All of the islands have large schools of fish, rays and sharks. You can dive the Cocos Islands year round, but perhaps the best time is August. "Hundreds and hundreds of white tip sharks swarming in crystal clear ebony coloured water weaving gracefully through the nooks and crannies of the coral below searching for a meal. Little fish hiding behind rocks and even divers, hoping not to be spied. Then - CRACK!!!! - a shark finds a morsel and send the hundreds of other shark into a frenzy of movement. Thirty seconds later, the slow graceful ballet of movement resumes as if nothing had happened. What a rush!! "Massive wall of hammerheads every time. Marble and eagle rays. Friendly whale sharks who enjoy the diver's bubbles for extended periods." "Dirty Rock is unbelieveable - we dove it 5 times on our liveaboard trip, and not once did it disappoint - schooling hammerheads, silkies, eagle rays, swarming white tips, and even a friendly dolphin. Definitely a top 20 dive"
"Huge schools of jacks, schooling hammerheads (up to 100 per school). Galapagos Sharks, turtles..... WOW"
"Great pelagic dive site. Biggest school of rays i have ever seen....Hundreds." "Jacque Cousteau's favorite dive site with even more hammerheads, cleaning stations, ++"
"Hammerheads, lots of them and very close up." The Catalina Islands are often visited because they are only 19 nautical mile/ 25 minutes from Tamarindo. It is very common to see white tip sharks, giant mantas, manta rays, fish such as buffoon, giant grouper, morays, and a great variety of many other species of different sizes and colours. It is best to descend to a depth of 18 m to encounter more species. At this depth the visibility is also better (horizontal visibility is approximately between 5 and 35 m). There are 6 dive sites regularly dived here. "The Main island after 2 separate dives delivered abundant white tip sharks, eagle rays and huge shoals of fish and some of the usual assortment of morays and octopus. On the second dive there was treated to the magic of schooling eagle rays that swooped by in formation in numbers upto 20 strong. Not good for macro or coral and the Mantas are mostly gone by May but one straggler was spotted in the blue. Memorable diving." "Lots of fish, not too deep, current was moderate, visibility fairly good, about 20-30 ft. Awesome for beginners but experienced divers will enjoy the multitude of sea life." "More dramatic, with a drop straight dow 60 ft alongside a huge rock. Giant reefs and loads of fish. Good visibility." Recommended by the locals. You may observe fish typical to the North Pacific and the most special part of Cabo Velas is the reef that looks like a garden under the water. Guanacaste is in the North West of Costa Rica. The area includes Bat Island, the Catalina islands and the Gulf of Papagayo. The rainy season is May to November - there are less tourists there then and bull sharks visit Bat Island. The visibility improves and weather is calmer during the dry season - especially March to May. Located in Santa Elena Peninsula, two and a half hours from Tamarindo. 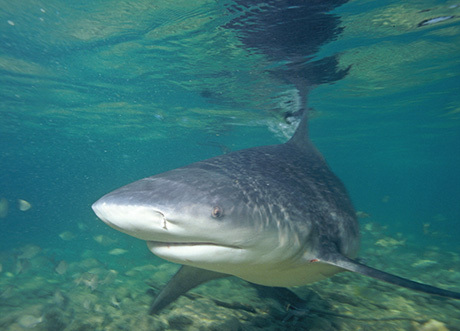 Offers a large variety of species: a major attraction are the Bull Sharks. The depth fluctuates between 9 and 28 m with beautiful rock formations. The islands also offer a refuge of parks where you may camp overnight. "First dive on Bat Island, 70 mins from Coco, I saw the elusive Bull Shark and a Manta Ray within 30 mins. Second dive there we saw enormous schools of fish and a modest collection of the smaller stuff. These islands it seems are better for pelagic and large schools and not so great for macro or coral lovers. Certainly a unique dive." There are over 40 dive sites in the Gulf Of Papagayo. Some of the more popular ones are Aqarium, Surprise, Virador, Monkey Head, Punta Gorda, Baja Tiburones for normal diving and Los Meros and Escorpiones for shallow dives. All are volcanic rock formations with lots of marine life such as spotted eagle rays, whitetip sharks, schooling fish, mobule and cow nosed rays, frog fish and sea horses. "Closer to shore in Coco you do get some more macro but the nudis are hard to locate but expect octopus, morays, sting rays and eagle rays in large numbers and the occasional whitetip shark and the customary huge schools of fish. Pretty good!" " I just love Caño Island. I had the opportunity to dive there 3 times (6 immersions) and yes, I think is like a mini Coco Island. During the dive is quite normal to see small/medium sharks "parked" in the bottom, turtles, eels and mantarayas. " "Great dive saw a whale shark!!! 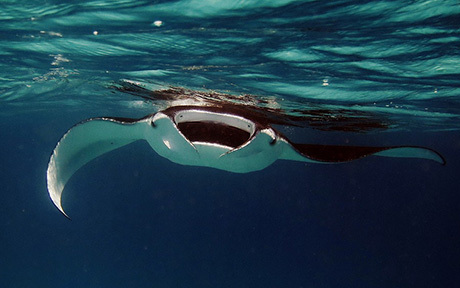 And like 3 mantas, good visibility. I've been to Drake Bay (which is near Cano Island) 3 years and plan on going these year again, awesome dive sites. Go there!" "Saw White tip shark, turtle, Many Jacks, and an eel. Visability was 30 feet. Photography was limited. Snorkeling was part of tour which was actually a little better than the dives. " "I dove Cano Island and it was AMAZING!!! I also dove in the Northern Pacific near Tamrindo and it was pretty good." "I just came back from Costa Rica and dived in the Cano Island near Drake bay, on the South Pacific coast. It was very interesting, lots of Sting-ray, white-tip-reef shark, etc. " "Small cave with sharks and eels. We didn't go inside, just dive in the front. But it's possible to see the sharks inside and other creatures. Clean water good visibility." 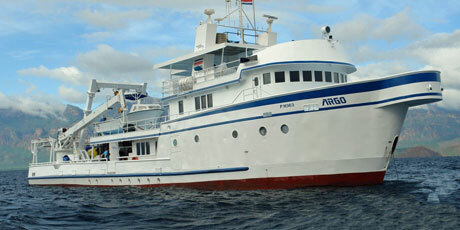 For trips to the world class Cocos islands dive sites you will need to take a liveaboard. Liveaboard trips here often last 10 days or more. 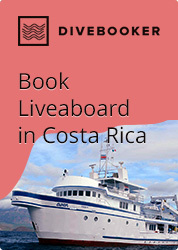 As well as the Cocos Islands the liveaboard often takes in Cano Island, Guanacaste and Bat Island. The luxurious steel-hulled argo liveaboard, accompanied by the 'deepsee' submersible, cruises to remote Cocos Island dive sites filled with large, schooling pelagics. Four passengers a day will have the opportunity to descend in the submersible. Liveaboard diving to Cocos Islands. Located on the Pacific Ocean at Playa Hermosa, a large beach on a paved road with trams to take you around the hotel, resort and villas. Offer packages for individuals, families and groups with special programs for children, mature travellers, honeymoon couples and non-divers. Privately escorted tours to volcanoes, hot springs, river rafting, tree top canopy, jungles, rain forests, horseback riding, wildlife refuges and national parks. Any of their scuba diving packages and land tours may be combined. Organise accommodation as well as diving. "Deep Blue Diving Adventures are a Padi Gold Palm Resort. We�ll be happy to dive with you and to make all arrangements for you. Our every day "2 Tank Morning dive" is $79, a 3 tank dive is $105. If you need equipment, full gear rental is $20 per day. The Catalina 2 tank dive trip is $110 and requires at least two divers. The trip to Islas Murci�lagos (Bat Islands) is 1 hour only and cost $ 150 per person for 2 dives with a minimum of 3 divers. Our prices include boat, captain, guide, tanks, weight, drinks, snacks and fun! May we help you with the accommodation? We offer the Hotel Puerta del Sol. A lovely Mediterranean style place, each room is equipped with ac, fan, coffee maker, fridge, bathroom with hot water, wireless internet and safe." " We are a PADI 5* IDC Centre and the only CDC facility in Costa Rica. We have a staff of 12 divers and several boats including a specially outfitted trimaran. We offer a great range of dive packages and can recommend good accommodation for every budget." Complete dive center, including a dive shop and offer all PADI Certificates. Located in the province of Puntarenas, Central Pacific. "Andrea was our dive master from the Aqua Center at the Playa Flamingo Resort. He was very nice and professional. I felt very comfortable during our 2-tank dive. We have gone with them for two years now. They also offer refresher courses and snorkelling trips, and offer dive sites for all levels of experience. Highly recommended. You can easily stay at Playa Flamingo resort or try to reserve a private house on the beach. We stayed at Casa Piedras which is right on the beach. The dive was $95 including equipment for a 2 tank dive trip. We went twice, to four different sites - there are many sites here. I thought it was fantastic! Amazing sunsets!" "Beware the boat staff! I had about 40,000 colones taken from my wallet while diving. I was daft for taking all my cash, but I had just been to the bank, and you expect to not get robbed on a dive boat. "Not certified? No problem, our staff of Padi and SSI dive professionals are committed to quality dive instruction & services. If you do not want to take the full certification we will train you the day before the scuba tour; you will watch some videos and practice in the pool with an Instructor." Scuba certification and yoga retreat - a week long yoga retreat where guests also get a CMAS 1 star scuba certification. "We are PADI 5 Star IDC Dive Resort offering a wide range of courses and a wide range of dives local to Quepos, offshore trips and to nearby Cano Island." "I joined a tour to Caño Island offered by a local company. The name is Costa Rica Dive and Surf. Great experience! Great service! Very professional team!" at Hotel Jinetes de Osa. "The diver centre of Jinetes de Osa were very helpful. Cost $130 for 2 dives, Cano island-1 hour boat ride and good lunch. Very helpful staff, they get all your gear ready for you!!!! A treat!" "Big boat, comfy space for loads of people. Fair price. Great operator." "Max 8 divers. Good food and snacks. " Costa Rica Outward Bound do 10 trips a year that involve diving, all of which students aged 18-24 years get college credits back in the US and Canada. Dive the Pacific, Catalinas, Bat Islaind, Caño Island. Invaluable for diving Florida, Caribbean or the Bahamas. Please send us your comments on Costa Rica. Do you want to recommend a diving centre or dive site?